My brother and I spent a LOT of time with our Atari and Nintendo systems as kids. I'll be honest, I really stopped video-gaming just as I left high school (Tetris was all the craze, if you're wondering when THAT was!). So, to see a video like this brings back memories of Kaboom, Frogger, Space Invaders, Pac Man...to me, the classics. Who is challenging you to think bigger? Between a walk around town and while at coffee today here in the Bahamas, I started conversations with the owners of two bakery/coffee shops and 3 staff members. In short bursts of conversation, we talked about the economy, tourism, education and "the why of it all." As we left the cafe where we talked, read and enjoyed coffee for a couple of hours, the last conversation was all about limits...One of the staff said, "My friends in university tell me that if I study __________, I probably won't find a job because people aren't hiring ___________'s anymore." If someone were following their heart, interest and passion, what would YOU suggest they do to create a career out of it? So, the first time I met Gay, he and his wife were the commencement speakers at USM (where I earned my MA in psychology). I remember thinking about how neat it was that they shared the stage together. 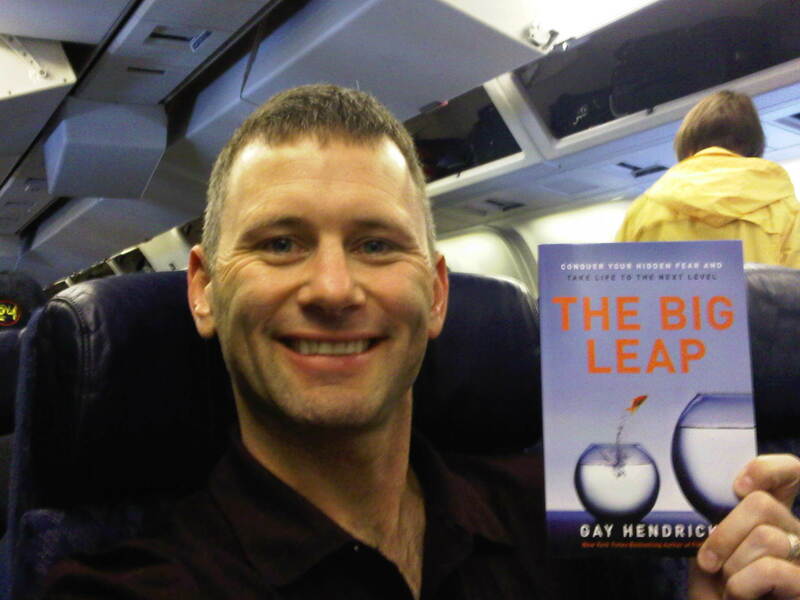 I've read his books (Conscious Golf, Conscious Breathing, and my fav: Conscious Loving) and on recommendation I picked up The Big Leap (thanks to superstar author and mentor, Pete Savage - The Wealthy Freelancer). He said, "Ya gotta read the chapter titled, "Einstein Time." So, I've got a 5 hour flight, and I'm already looking forward to it! As I sat and watched the video for 5 and a half minutes, i reflected on the seeming dissonance between this overall want (at least the want I get from clients) to "save time, work more efficiently, have more time at the end of the day to do what I want..." and a general apprehension toward just how much the digital world, cyberspace and technology take over (take control). I remember the first time I used a "self-checkout" service in a store. Looking around, I realized that an entirely new experience was possible! No more "cranky clerks." I know, I know, it's not the most positive way to look at the world; however, I am continually surprised by the different levels (positive AND negative) of customer service which exist out there. Of course, as I see this video, MY thoughts turn to the learning/leadership/learnership models that could exist following the "Internet of Things." If you've been reading this blog for a while now, you know I'm a huge fan of Wayne Hodgins. I met him in the year 2000, and have followed his stuff ever since. His entire methodology - when I met him - was: What are the basics of what we're doing, and how can we do those more effectively. Good stuff! Now that I'm deep into the writing of the next book (email me, please, to get on the pre-release list!) I'm fascinated by what it's going to look like when we get it out there! As such, I'm getting all kinds of ideas from the people I know and who are helping me along the way. Let's hear it for mentors and friends who have our success and best interests in mind! ﻿In February, 2010, Jodi and I presented three workshops in Venice, Italy for an organization named Generali. We were speakers during their "Leonardo Alumni Event," where over 100 people were invited to learn about professional development through deepening networks and relationships. This is an area of focus in both my advising and mentoring, and Jodi's newer company, No More Nylons. we bought tickets, and planned to attend. THEN, the most incredible thing happened: Jodi decided she wanted to present a workshop based on her experience as an entrepreneur and community leader. Over the past 20 months, her Women's Business Social events have grown and grown; last month she had over 200 people attending her "get together and chat" event, here in Ojai, CA. ﻿As with any conference leveraging such interest as gender equality, leadership traits and future-thinking, I was astounded by the focus I felt coming from different people throughout the conference. For example, one speaker was Senator the Honourable Marlene Malahoo Forte from Jamaica. She spoke on the future of an island economy, and how the leadership there is focusing on education and rural, local, economic development to move into the 21st century. A comment she made that I wrote down in BIG letters in my Moleskine journal is: "If you need skills and you know what they are: Go get them!" I can remember still the smile on her face as she gave an audience of 700 people this advice. It was a good thing that she spoke on day one of the conference; I spent the next 3 days identifying skills to improve/enhance/learn. Realizing the need to share stories of hope, generosity, and achievement, I'm as committed as ever to my motto: "Just Show Up." I hope you are too. I've always been a collaborator. 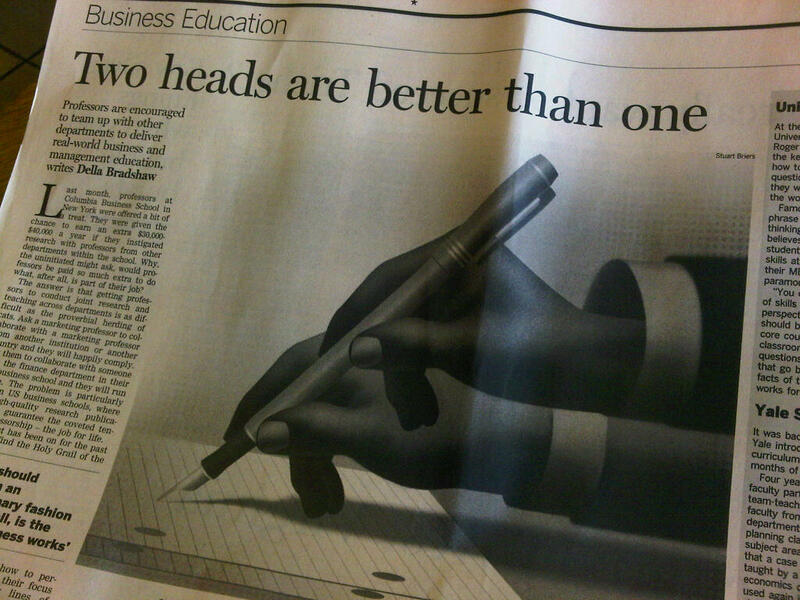 Here, in the FT, I read an article outlining ways and reasons to work together. I see clients every day need to meet with people near and far - not just in actual distance, but in divisional units within the organization. Last week, I was working to bridge conversations between research, human resources, talent development and the C suite.